Our first day at our big kid job with the Miami Heat. The LUTN team is so embarrassing taking photos of us! March really was madness for LUTN with all the events we had this month, over 25 (1 for every day) to be exact and that’s not including our daily and recurring weekend gigs! 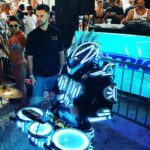 But we aren’t complaining, it was a great month and we were lucky to be able to participate in so much, from being on Inception’s festival cruise to travelling to NEW York for Seminole Hard Rock to becoming the official LED robots for the Miami Heat, it was one of our best month’s so far this year. 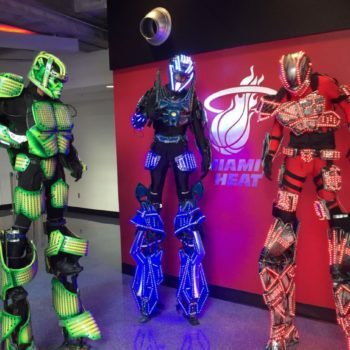 Definitely a big event to highlight was our new gig with the Miami Heat organisation as the sole LED-entertainment for their games and events. It’s not just 3 of our LED robots but our LED drummer, mobile sound system and CO2 guns. We even got featured on ESPN, FOX and other media outlets! It’s been a great month and we can’t wait to see what’s to come. LET’S GO HEAT! LUTN co-hosted a pool party at Bahia Cabana Beach Resort in FTL, FL with Kapoya Energy Drink and had Yes Julz! as our official hostess on Easter Sunday (sorry mom!). We featured artists including DJ Mummy, Chanel Claire, Doc Brown, DJ Crespo and Walshy Fire from Major Lazor. Tickets were only $25-$45 and everyone got to have a free bar from 1-3 PM and a nice pool to cool them off from the Florida heat. Our promo models and LED robots were also there to keep it going! 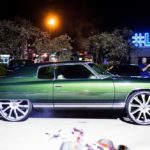 Our monthly block party, LUTB was themed “Light Up The Block: LUTN Fest” to go with the big MMW and WMC events going on that month. We had local vendors, food trucks, a car meet, a live DJ & entertainment, art galleries, kids activities and other things FREE to the public! We even had Kapoya Energy Drink co-sponsor with ther LED-walled trucks driving around and passing out free zero-calorie drinks. Feeling FOMO because you missed it? Join us every LAST SATURDAY of the month! Check out our Instagram (@lutnofficial) for all updates! Winter Music Conference & Miami Music Week were live and we got to be a part of it all month. One of our favorite events was the Electric Beach Party at Nikki Beach. 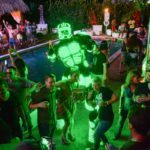 We had our LED robots, LED drummer, CO2 guns, promo team & just a little confetti there to take the party from day-to-night. We got to party with the likes of Cocodrills, Doorly, 2 Live Crew & Far East Movement. 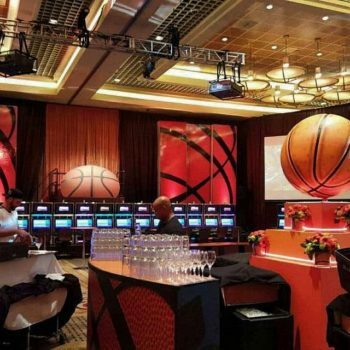 March Madness setup for Seminole Hardrock(Hollywood, FL). Included custom wrapped bars, vinyl- walls, custom decor & builds. We spent a weekend on the sea for Inception At Sea cruise with our LED stiltwalkers partying next to DJ’s like Cazzette, The Chainsmokers, Otto Knows & Sidney Samson, made promo appearances with our promo models & robot at the monthly Wynwood Art walk, partied for Sunday brunch at Himmarshee Public House with our robot & drummer, had back-to-back weddings at the W South Beach and the Biltmore Hotel featuring our LED entertainment thanks to Bitton Events, a large wall, bars & custom build setup for March Madness at the Seminole Hard Rock, and the FIU Awards Show at the Fontainebleau Hotelwhere we entertained guests with our LED Robot army who kicked off the after party. CALLING ALL ROBOTS, IT’S TIME TO LIGHT IT UP! WANT TO MAKE YOUR PARTY THE PLACE TO BE? WE HAVE ALL THE ESSENTIALS YOU NEED! ZOMBIES ARE COMING!! ARE YOU PREPARED?